Skytrax (originally known as Inflight Research Services) is a United Kingdom–based consultancy which runs an airline and airport review and ranking site. Skytrax conducts research for commercial airlines, as well as taking surveys from international travelers to rate cabin staff, airports, airlines, airline lounges, in-flight entertainment, on-board catering, and several other elements of air travel. Apart from these evaluations, Skytrax has an airline forum where passengers give potential passengers insights and opinions about an airline. The website also hosts flight reviews, flight checks, and satisfaction surveys. Skytrax holds an annual World Airline Awards and World Airport Awards, as well as the ranking for airlines and airports. In 2012, the online investigations company KwikChex filed five complaints with the UK Advertising Standards Authority related to statements on the Skytrax web site describing the volume and reliability of their reviews as well as the official status and update frequency of their ratings. The Authority upheld all five complaints and Skytrax agreed to modify some promotional wording. Inflight Research Services sent some information to the UK House of Lords Select Committee on Science and Technology's Fifth Report regarding seat pitch in 2000. Skytrax presents awards annually to airports and airlines that it considers noteworthy in their performance. ^ "AirlineQuality.com WHOIS, DNS, & Domain Info - DomainTools". Retrieved 10 May 2015. ^ Mario Kossmann (2006). Delivering Excellent Service Quality in Aviation. Ashgate Publishing. pp. 67–71. ISBN 0-7546-4725-0. ^ "ASA Ruling on Skytrax Research". asa.org.uk. ^ Engel Schmidl (13 November 2012). "Advertising Standards Authority calls out Tripadvisor and Skytrax for fake user reviews". SmartCompany.com.au. Retrieved 10 May 2015. ^ "Select Committee on Science and Technology Fifth Report". United Kingdom Parliament. 15 November 2000. Retrieved 25 November 2007. ^ "Cathay named Airline of the Year". Contineo Media. Archived from the original on 5 February 2013. Retrieved 3 December 2012. ^ a b "The winning edge". Retrieved 10 May 2015. ^ "Qatar Airways is a repeat winner of World's Best Airline Award at Farnborough Air Show". Skytrax. Archived from the original on 11 December 2012. Retrieved 3 December 2012. ^ "Top 10 airlines". Retrieved 4 January 2014. ^ "World's Best Airlines". Retrieved 16 June 2015. ^ "World's Best Airlines". Retrieved 12 July 2016. ^ "World's Best Airlines". Retrieved 20 June 2017. ^ "World's Best Airlines". Retrieved 17 July 2018. ^ "Survey Lists HK Int'l Airport As World's Best Airport 2001". people.com.cn. ^ smh. "Sydney Airport wins another top ranking in world airport survey - Latest Travel News - ASIA Travel Tips.com". Retrieved 10 May 2015. ^ "Hong Kong honoured as the world's Best Airport for the third straight year" (Press release). Airport Authority Hong Kong. Retrieved 3 December 2012. ^ "The world's 5 Star Airlines". SKYTRAX. ^ Kaur, Karamjit (9 January 2004). "Changi named world's best airport; It wins 18 top awards from industry organisations, magazines; SIA shares top honours as best airline". The Straits Times (Singapore). ^ Williams, Geoffrey (23 March 2002). "Airline of the Year; No. 1 in the skies". The Advertiser. ^ "World's Best Regional Airlines 2018". worldairlineawards.com. Retrieved 31 December 2018. ^ "The World's Best Airline Alliance in 2017". www.worldairlineawards.com. ^ "The World's Best Airline Alliance in 2018". www.worldairlineawards.com. ^ "World's Best Airport Terminals". 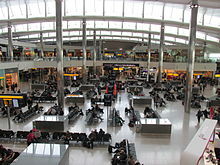 ^ "The world's 5 Star Airports". SKYTRAX. ^ "Платов стал первым в России аэропортом с пятью звездами Skytrax". cityporter.ru. 12 February 2019.